On the morning of November 5th, the highest astronomical tide of the year–the so-called King Tide–will swamp low-lying areas throughout Hampton Roads, with water peaking at 2 feet above mean sea level. By 2050, that is likely to be the new normal. "King tides are increasingly viewed as harbingers of things to come as sea levels rise," says Dr. Derek Loftis, an assistant research scientist at William & Mary's Virginia Institute of Marine Science. "Where the tide reaches on November 5th is where you can expect the water to be just about every day at mid-century." Now, Loftis has teamed with environmental reporter David Mayfield of The Virginian-Pilot, which along with WHRO Public Media, the Daily Press, and WVEC-TV are sponsoring a "Catch the King" event that will encourage local citizens to measure the reach of this year's highest tide using a purpose-built smart-phone app. The freely available SeaLevelRise app was created by the non-profit Wetlands Watch and software developer Concursive, both based in Norfolk. It allows users to record GPS coordinates as they trace the landward reach of a flood event, whether due to a particularly high tide, a storm, or a combination of the two. The app then uploads these data points to an online map that anyone can see–whether in the app or on the Sea Rising Solutions website. Supporting the Catch the King event is the Commonwealth Center for Recurrent Flooding Resiliency, a partnership between VIMS, Old Dominion University, and the Virginia Coastal Policy Center at W&M Law School. Professor Mark Luckenbach, Associate Dean of Research and Advisory Services at VIMS, describes the CCRFR as a "'one-stop shop' for scientific, socio-economic, legal, and policy analyses aimed at building Virginia's resilience against flooding." The Center was established in 2016 by Virginia's General Assembly through the support of chief patron Delegate Chris Stolle. "The Commonwealth's continued support enables Center researchers like myself to focus on flood-related issues that matter in Virginia," says Loftis. "The Commonwealth's investment in research allows me to address issues of national and even global scale, while applying solutions locally." Those interested in participating in the Catch the King event can download the SeaLevelRise app for either iOS or Android beforehand; to contribute pictures or GPS data requires establishing a free account. High tides on October 7-8 will provide good opportunities for practice. Loftis describes the Catch the King event as "a low-stakes dress rehearsal that will help us better understand the risk of recurrent flooding in Hampton Roads, while laying the groundwork for a volunteer data-collection network for use during more substantial flood events." In addition to helping local citizens visualize and recognize the threat of rising seas, the Catch the King event will provide critical data for improving the computer models that researchers at VIMS and elsewhere have developed to forecast the reach of coastal flooding. "Participants will feed valuable data to scientists building predictive models for near-term events like storm surge and for long-term events like climate change," says Loftis. 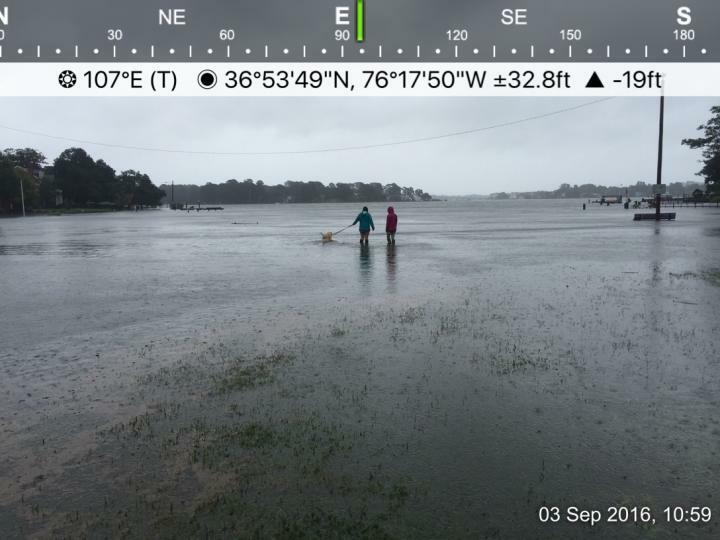 Modelers like Loftis and VIMS professors Harry Wang and Joseph Zhang can compare the landward extent of this year's King Tide as mapped by the citizen-scientists with its extent as calculated in their simulations, using any discrepancies to improve model performance. This process of "ground-truthing" a model with observed data is a long-standing and important part of model development, and has been used in fields as diverse as marine science, speech recognition, and finance. "Tidal flooding, especially in urban settings and when compounded by wind and rain, is a complex modeling problem," says Loftis. "It can be better understood with more field data, whether that's collected by water-level sensors or citizen-scientists. We're really excited to see how much ground data we can collect during November's King Tide."